Are you feeling the leadership gap? Organizations across industry, sector and at all management levels are finding that today’s leadership capacity is not meeting current needs, let alone challenges we’ll face in the future. Talent is your most valuable asset and investing in the right training and support can have a tremendous impact. Your team leaders can learn to better engage and inspire others, manage change, think strategically and build critical competencies throughout their leadership journey. The Leadership Green Room offers transformational learning opportunities for every level of your organization and has quickly become the premier leadership development resource in the region. Courses immerse participants in breakthrough thinking alongside professional peers, so they can return to the workplace with greater confidence, know-how and a network of learning partners. The Leadership Green Room is the professional development arm of the Leadership Louisville Center, a trusted regional resource for 40 years. All courses are hosted at the Center’s new location at 707 W. Main Street in Louisville, Kentucky. The facility is designed to be a nationally-recognized center for leadership development and social innovation, surrounded by natural light and equipped with modern technologies and amenities. Visitors to Louisville have easy access to hotels and after-hours activities in the heart of downtown’s Museum Row. Leadership Louisville Center members receive discounts on all courses. See individual course pages for discount. July-December 2019 course catalog to be released in May 2019. Leadership Louisville Center is a Human Resources Certification Institute (HRCI) and Society of Human Resources Management (SHRM) approved provider. At the conclusion of Green Room courses, the Leadership Louisville Center will provide the following documentation for CEU credit purposes: Date, record of individual attendance, course title and description, workshop/event agenda, facilitator bios, course hours, and educator signature. Approval is at the discretion of specific licensing boards or agencies. The HR Certification Institute® (HRCI®) has pre-approved most of these courses – see individual course pages for the number of PDC hours applicable for each course. The use of this seal confirms that the activities have met HR Certification Institute’s® (HRCI®) criteria for recertification credit pre-approval. 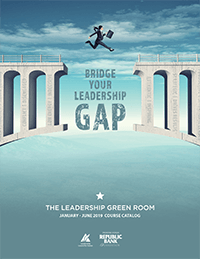 The Leadership Green Room courses can be submitted for Continuing Professional Education (CPE) for individuals licensed to practice as certified public accountants. At the conclusion of each course, the Leadership Louisville Center will provide the following documentation for CPE credit purposes: Date, record of individual attendance, course title and description, workshop/event agenda, facilitator bios, course hours, and educator signature. This meets the documentation required by the Kentucky Board of Accountancy for CPE credits, although the state board of accountancy has the final authority on the acceptance of individual courses for CPE credit.